Closing the New Lanark Family Fun Day on Sunday August 31, Glen Williams, Chair of UNISON’s Local Government Service Executive, slammed the continued public pay restraint, contrasted against the plans for 11% rises for MPs, and obscene increases for cabinet advisers – in one case a rise of 36%. Yet there is no money for the public sector workers to get a decent rise. It would cost £1bn for a 5% pay rise, whilst Trident costs £32bn. There is money, it’s just what you choose to spend it on. This is robbery. It’s not a recession. He acknowledged that the living wage in local government in Scotland did mean that things were a bit better here than in England and Wales, where local government members will be taking their next day of industrial action in October. However, we have all been suffering from under inflation pay rises for years. Moreover, it’s not just about pay explained Glen, but about the refusal to negotiate – in essence our employers might as well be tearing up our collective agreements. It is time for us all to draw the line in the sand. It was a very stimulating end to the New Lanark Family Fun Day – food for thought. Watch out for your local government ballot paper after 9 September and make sure you take your vote. UNISON is asking you to vote in favour of industrial action. On a lighter note, over the course of the day, we had some great music from Alastair McDonald, Pauline Bradley, Liam Toner and Hilary McFarlane, with a variety of songs from the three acts from You Cannie Throw your Piece off a Twenty Storey Flat, right through to Black Sabbath’s Paranoid. There were plenty of other activities including birds of prey, and Indian Head Massages, and for the kids – the bouncy castle, balloon modelling, and face painting. There’s not long to go before the Scottish nation takes the Independence vote. 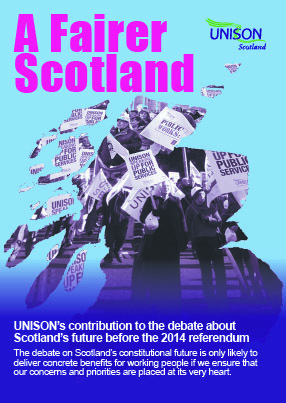 UNISON activists and members have had the opportunity to contribute to an interesting debate and to continue to put our politicians on the spot demanding a fairer Scotland regardless of the outcome of the Referendum on 18 September. UNISON’s position remains that we do not have a policy position either way on the referendum debate. We continue to scrutinise the positions of the various campaigns and would urge all sides to explain to our members how they intend to go about creating a more just, fairer society in Scotland. Any constitutional change should be a means to that end and not an objective in itself. Members in Scottish Local Government will be balloted on a programme of industrial action in support of an improved pay offer between 9 September and 29 September. This follows the result of the recent consultative ballot where members voted by 65% to 35% in favour of moving to a formal industrial action ballot in support of an improved offer. UNISON wants to make employers think again about imposing another paltry pay award and that they prepare to negotiate with us to achieve a fair pay settlement that seeks to address the years of below inflation rises and freezes. This is a political campaign that needs to persuade politicians in councils and parliaments that we deserve a pay rise. So we will ask members to write to Councillors and MSPs, to visit their surgeries, to lobby them and protest against their lack of care for Council employees. South Lanarkshire UNISON hosted an interesting Social Media Seminar on Monday 25 August, highlighting the need to embrace this technology as an important element in any organisation’s communications strategy, complementing the more traditional means of getting messages out to our members. Like many of us, Carolyne Mitchell,, South Lanarkshire Council’s information officer, would describe herself as a late developer in digital terms. As well as being responsible for the Council’s use of social media, Carolyne is now an ardent social media user herself. The rate of change of the internet and the growing interaction with users has been phenomenal and it’s an opportunity that cannot be ignored – especially as the generations of digital natives are starting to hit the workforce. Warning of the digital dossier – Carolyne described the digital tracks that an individual leaves behind from the first ultrasound scan right right through to their ultimate demise and beyond. Indeed, Leah Lockhart from the Scottish Government, advised that the use of Google and other search engines amasses information from users’ searches to target advertisements at individuals. 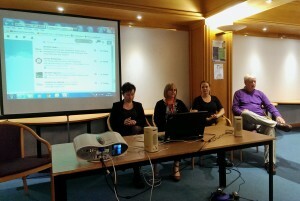 Alison Jaconelli from UNISON Scotland’s Disabled Members Group explained that they wanted more control of their communications, so set up a Facebook page, and a Twitter account. This has allowed the group not only to build awareness of their work within UNISON and get information out to members quickly, but has also given them the opportunity to challenge the public’s perceptions, drawing people in through the clever use of photos and videos. Alison also explained how they are now giving people the option to participate in their committee meeting via video conference. This has been a marked success. Jim McCann, Emcom, a company that assists small business in facing the digital challenges, emphasised that it’s not just young people who use social media and it’s a great low cost and immediate means of getting out to members. Watch this space! 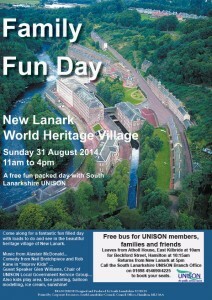 Come along for a fantastic fun filled family day at the beautiful heritage village of New Lanark. There is plenty to see and do with music from Scottish folk singer Alastair McDonald and some Scottish comedy from the Improv Kids aka Neil Bratchpiece and Rob Kane . We are pleased to welcome Glen Williams, the Local Government Chair for UNISON as the guest speaker to finish the day on a high note. With a play area, face painting, balloon modelling, ice cream and sunshine, there is plenty for the kids too. Contact the branch to book your free places on the bus from East Kilbride and Hamilton.